On an evening like any other, nine-year-old Katie Mackey, daughter of the most affluent family in a small town on the plains of Indiana, sets out on her bicycle to return some library books. This simple act is at the heart of The Bright Forever, a deeply affecting novel about the choices people make that change their lives forever. Fact, speculation, and contradiction play off one another as the details about Katie's disappearance--and about the townspeople--unfold, creating a fast-paced story that is as gripping as it is richly human. 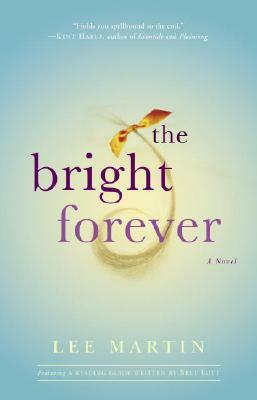 A nuanced portrayal of the complicated give and take among people struggling to maintain their humanity in the shadow of a loss, The Bright Forever is a compelling and emotional tale about the human need to know even the hardest truth. Lee Martin is the author of the Pulitzer Prize finalist The Bright Forever; as well as the novels River of Heaven and Quakertown; a story collection, The Least You Need to Know; and two memoirs, From Our House and Turning Bones. He has won a fellowship from the National Endowment for the Arts, the Mary McCarthy Prize in Short Fiction, a Lawrence Foundation Award, and the Glenna Luschei Award. He lives in Columbus, Ohio, where he teaches in the MFA in Creative Writing Program at The Ohio State University. Visit him at www.leemartinauthor.com.